Are you smiling? I hope so! I had a little fun with this “In a Vase on Monday” post. I came across these cute puppets last week when I was deep cleaning our playroom (read: went through all of the toys to get rid of what wasn’t played with anymore). I’m hopeless though, and only a few things were actually taken away. Items like these cute puppets were just squished into higher-up cabinets to have on hand for little visitors. (Did ya like that pun?) Somehow, thankfully, the room did end up tidied and I found some props for my post! I really can’t believe it is nearing the end of March. The weather was true to the expression: it was crazy at the beginning of the month and it has thankfully calmed down (enough to garden at least!). Daffodil season in full swing (Ice King & Tresamble). These large daffodils have since turned a creamy white. the Ice King variety resembles a carnation. We have collected quite a few different varieties of daffodils over the past few years and I am really liking all of them! The small daffodils (Velocity) I bought from Mr. Middleton’s Garden Shop in Dublin. The catalogue describes them perfectly: early dwarf daffodil with deep yellow strongly reflexed petals and an orange red corona. So true! I have only one pink anemone, but I thought it was stunning so I had to add it. It is my favourite colour of pink! Just one little bloom for the vase. This little guy is planted in a container. He did really well last year, and I’m delighted to see flowers again this year. I’ve read that the anemone will do better after several years. Lovely news! We have been so lucky to have good weather on the weekends. I have so enjoyed working in the garden! The sunny days help to inspire creating an arrangement. The Mr Fokker Anemone fade to a light purple as they age. They start a lovely deep, dark purple. I missed quite a few ‘In a Vase on Monday’ postings this winter. I have to say it is nice to be back at it again. I hope you will also join us! Cathy at Rambling in the Garden https://ramblinginthegarden.wordpress.com/2015/03/23/in-a-vase-on-monday-between-sweet-williams-two-lips/ hosts this fun (read: addictive) meme. You will see some lovely arrangements when you stop by! 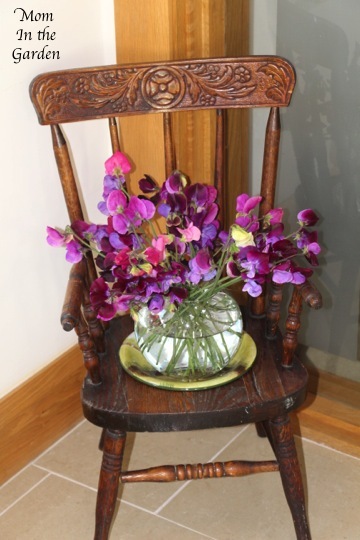 It has been quite a while since I’ve joined the meme “In a Vase on Monday” with Cathy at Rambling in the Garden https://ramblinginthegarden.wordpress.com . This weekend just allowed me the time/energy/ability to gather together a small vase of sweet flowers, so I thought I’d humbly join back into the group. Feel free to join in, or just go and have a look at what others have in their vases. There is always something nice to see! My friend Susan also gave me a Pulmonaria plant and suggested they look well with daffodils. I couldn’t agree more. I have them planted in among my daffodils, but my daffodils come up so late! So I’ve cut some of the Pulmonaria and thrown them in a vase with my early blooming tete-a-tetes to enjoy that lovely colour combination. The sun came out for a total of five minutes (after I had taken loads of pictures, of course). I’m used to how this works, so I grabbed the vase and ran outside and took a load more photos! You can really see the size difference in this photo. I should have put the full size daffodils in a separate vase, but I only had two to work with. I hope you enjoyed my arrangement. Thanks for stopping by!